Why one couple left behind the trappings of the corporate world to chase the growing industry of professional pet care. Matthew and Arlette Woods blame the transformative decision to change their lives on their chocolate lab, Geisha. Geisha had a bad experience at a kennel. She came home scraped up and traumatized, and the couple found an alternative to conventional kenneling at Camp Bow Wow in Elk Grove — one location of the national canine day care and boarding center “where a dog can be a dog.” The Woods fell in love with the concept and facility. At the time, Matthew and Arlette were professionally unhappy and unfulfilled: Matthew was a maintenance production supervisor for the American Airlines fleet at San Francisco International Airport, commuting for 15-hour days working graveyard shifts; Arlette was a fraud investigator for a major national bank, commuting to Stockton to crunch numbers on a computer all day. One night, they both came home worn out from yet another long work day, and a seemingly innocuous comment sparked a decision that changed everything. “I have to do something else,” Arlette said to Matthew. It was as if a light bulb had flickered on: Arlette, whose sister is a veterinarian, has always loved dogs, and Matthew suggested then that she pursue a career working with canines. Geisha and Camp Bow Wow immediately came to mind. 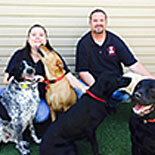 Seven years ago, Arlette left behind the corporate world and the paychecks that came with it, the couple took out a third mortgage on their house, and they bought their first Camp Bow Wow location in Livermore, Calif.
Two years later, Matthew followed suit. “It was scary,” he says. “It still is scary.” Today, the Woods own two Camp Bow Wow locations, including the Elk Grove facility where they first took Geisha. They say their entire lives have changed for the better. “It just came down to that we wanted to improve our quality of life,” Matthew says. “We wanted to work for ourselves, to do something that was rewarding, and being with the dogs is very rewarding for us emotionally. Camp Bow Wow is strikingly different from many conventional kennels, where dogs are often kept confined for the majority of the day. Here, dogs undergo “interviews” and are separated by size, age and temperament in large play areas. The areas are monitored by web cameras. The dogs roam and play with like-minded companions all day, returning to cabins only to eat and sleep. Matthew and Arlette got into the business at the perfect time: The professional pet care industry has more than doubled in the last decade, according to 2015 data from the American Pet Product Association. Camp Bow Wow, founded by Heidi Ganahl, has been franchising locations since 2003 and has 200 facilities in 40 states, plus one in Canada. The brand is valued at more than $86 million. The Woods had to learn on the fly how to both run a business and provide the quality care for the dogs befitting of the Camp Bow Wow moniker. They benefitted from the established brand recognition but had to adjust their respective management styles, build a committed staff, and iron out the details involved in caring for the animals. Both husband and wife serve, on a given day, any number of roles related to the business: administrator, cleaner, IT support, operator, pack leader, and the list goes on. With a staff approaching 30 employees — without whom the Woods say the operation would not be possible — the weight has eased. But the phone never stops ringing, and caring for the dogs is a 7-day commitment, because “dogs don’t know what day of the week it is,” Arlette says. “If you love dogs, you can understand,” she continues. “If I’m having a rough day, I’ll go back into the yard, be with the dogs, let them jump on me, and it just makes my day. Since making the change, the couple’s lives have improved dramatically: Their business is robust and growing, they work regular hours together, and they have time to spend more time with their two children and, of course, Geisha, the 4-legged culprit ultimately responsible for the couple’s new path.